A number of innovations, including performance-based contracting, are being implemented in the reconstruction of a two-lane rural road in Clare County, Mich. The 5.5-mile-long (8.8-kilometer-long) project is on M-115, a trunkline route that serves as a primary connector for summer tourists traveling from the metropolitan Detroit area to northwestern Michigan. The Michigan Department of Transportation received a $1 million Highways for LIFE grant for its use of innovations on the project. The original roadway is concrete pavement placed in 1940 and later overlaid with asphalt. This year, the state chose Central Asphalt Inc. of Mt. Pleasant, Mich., to rebuild the road—working under an innovative $4.5 million performance-based contract. Performance contracting is an approach in which the contractor is responsible for achieving defined goals and proposing how it will achieve them. The contractor is awarded incentives or assessed penalties based on its performance against the contract goals. For M-115, the Michigan DOT based the contractor selection on both best-value qualifications and price, said Jack Hofweber, development engineer for the agency. The state set goals in several areas, including the date the roadway would reopen to traffic, pavement performance, work zone safety and motorist travel delay. The contractor began construction by removing the existing asphalt overlay with a milling machine and rubblizing the concrete. Rubblizing the concrete and then placing a crack relief layer of open-graded hot-mix asphalt is a method designed to eliminate reflective cracking, said Hofweber. Next the contractor laid down a leveling course of hot-mix asphalt, followed by a top course. The contractor proposed the pavement design to better ensure pavement performance during the warranty period. The contractor warranted the construction of the new roadway for five years, Hofweber said. If significant distresses develop in the form of rutting, cracking or raveling during that time, the contractor must repair the damage at no cost to the state. 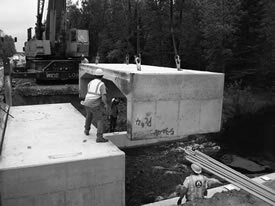 Precast bridge segments reduced construction time for two bridges on M-115 in rural Michigan. Photo credit: Michigan DOT. To speed construction and meet motorist travel delay goals, the contractor added a temporary travel lane alongside the existing roadway. The temporary lane allowed traffic to continue flowing in both directions during construction, Hofweber said. A more conventional method would have been to close down one lane for two miles (3.2 kilometers) at a time for construction, then route traffic through—first in one direction, then in another—on the open lane. “With the temporary lane, the contractor worked on the full 5.5 miles all at once,” said Hofweber. “That saved approximately four weeks on the construction schedule.” As a result, the driving public was subjected to less inconvenience in the project area. The contract also called for replacing the superstructures on two small bridges. The new superstructures, said Hofweber, were built with precast concrete beams and deck members—and that innovation saved considerable time, compared to using cast-in-place construction. Another innovation was the use of buffalo grass mixture alongside the roadway. Deer-car crashes have been a problem on M-115, and deer do not like to eat the buffalo grass mixture, Hofweber said. Deer did like to eat the previous grass mixture that was planted in the area. Automatically actuated temporary traffic signals sensed the number of cars waiting to cross at both bridge construction sites. Rumble strips along the centerline and shoulders give drivers an audible warning if they leave the driving lane. hot-mix asphalt was paved continuously over the bridge approaches and onto the precast concrete bridge decks, creating a smoother transition with less tire-pavement noise. The use of a material transfer device in paving the top course of hot-mix asphalt will improve the uniformity and quality of the pavement and the smoothness of the ride. The two bridges were constructed in May and June of 2008. The road construction began in August and was scheduled to end in November 2008. For more information, contact Tom Fudaly at thomas.fudaly@dot.gov or (517) 702-1831. Gretter: It's any process or product that helps us do our jobs better. Ralls: To me, innovation is simply doing something in a better way. Michel: Innovation is something new or different, something we haven't done before. Innovation is not the same old thing packaged differently. Orcutt: It's more than introducing the new product or ideas. You have to show results. You have to prove business cases for innovations. Lord: I look at innovation as finding a better way to meet a need that has not been used before. Innovation is a spirit of creativity and exploration. It is a search for the best solution. Diewald: We innovate to improve performance or quality, or to save money. An innovation can be a device, method, procedure, technique, material, etc., that can do these things. An innovation becomes an innovation by virtue of being used. An invention is not an innovation until it is used. Why is it important for the highway industry to innovate now? Lord: The highway industry is facing growing challenges: rapidly escalating costs, a growing backlog of needs, and increased demand for services, congestion, fatalities and injuries. More than ever, it is essential to actively search for and rapidly implement the best possible solutions to meet these challenges. Gretter: In the face of funding constraints, rising costs of construction supplies and land, escalating driver expectations and an aging infrastructure, the highway industry faces the challenge of doing more with less. One way to confront the challenges is through innovation. Diewald: When you have twice as many drivers on a system that hasn't grown appreciably in 20 years, there is a strain on the physical system. Innovation can relieve some of the pressure. Michel: Instead of reaching back to the changes we've tried before, we need to reach forward and be truly innovative in our thinking. This is essential in the highway industry because we are moving ever-increasing mass and quantities through a finite space. Eventually, something's got to give. Thinking creatively now will help us erase the scenario of our current highway system becoming obsolete. Ralls: Our nation's transportation infrastructure is aging, with many of our bridges reaching the end of their service lives. But we can't rehabilitate or replace this infrastructure the way we built it originally because now we must maintain traffic flow. To maintain traffic flow while replacing deficient infrastructure is no small task. It requires doing things differently, and that means innovation. Also, the ever-increasing number of deficient bridges requires that they be built better to last longer, and that means using better materials and methods. Again, innovation is the answer. Orcutt: Many DOTs are experiencing a change of leadership as more managers become eligible for retirement, so many of us are going to have young leaders in the near future. It's a good time to be thinking about doing something new and different. What keeps highway agencies and other players in the highway community from being as innovative as they could be? Gretter: The necessity of managing risk often results in public officials going with the solution they know—rather than a solution that might introduce unknown risks. Orcutt: There's no simple answer. I recently wrote a paper on roadblocks to innovation at Caltrans that included results of a survey of research directors in 25 state DOTs. Resistance to change is the biggest roadblock that came up on the survey, as well as lack of political will. Generally, when you do something different it means it's going to affect someone. You have to be willing to take on that challenge. You have to weigh the risks of success and failure and what the public response might be. The consequences of a public agency failing are a lot different than for a private entity. Diewald: The public sector has an incentive system that does not promote or reward innovators. The downside risks involved in innovating are appreciable, particularly in the public sector, and the public sector does not attract the most innovative amongst us. Ralls:Highway agencies are the owners of the infrastructure and as such have the most incentive to take the lead in the use of innovation to get the job done. However, they are having to do more with less, and changing standard practice takes time and effort. Innovation also inherently involves risk since it's a new way of doing something. Higher risk typically means higher bids, especially for the first use of an innovation, and highway agencies want to be good stewards of the limited public funds. What can the highway industry learn from other industries about innovation? Ralls: Knowing about innovations used in other industries can spur ideas for how these or similar innovations could also address challenges in the highway industry. Lord: We can learn from their experiences in adopting innovation. We can benefit from the lessons they learned in deploying innovative practices. We can identify the challenges they overcame and what they did to adopt the innovations. Diewald: We need to look more closely at other public sector innovation successes to find lessons learned, while also recognizing there are lessons to be learned from other industries. However, these lessons need to be carefully vetted because they often don't apply to public sector circumstances. I have seen this theme discussed for many years—the grass is greener over there, but so is poison ivy—with little useful outcome. How can organizations—and the people in them—become more innovative? Gretter: By educating themselves on new options, by involving constituents impacted by decisions in the decision-making process, and by implementing a risk management approach on their projects. Orcutt: There should be incentives for people who are willing to champion new things. Probably less than 10 percent are willing to do something new and different. We need to find out who these people are and start helping them. We also need a specialty group in DOTs focusing on how to get information on innovations out to everyone in the department. One of the biggest problems in innovation is that we don't communicate it very well. We need to do a better job of marketing innovation. Diewald: There are some incredibly dedicated public servants amongst us, and many of them embrace innovation. We need to use them to guide and train others so they understand the value of innovation. Ralls: Organizations and their personnel need to understand that embracing innovation is the most cost-effective way to get the job done. This is not always apparent and may require a paradigm shift in thinking. Lord: A strong commitment from the organization's leaders is critical. Recognition of the power of innovation is important. Everyone needs to be convinced. Understanding the needs of first-time users and providing them with technical support to successfully implement the new practices are indispensable. Careful documentation of the benefits is a valuable asset in convincing decision makers to move forward with new ideas and practices. Throughout history and across industries, many experts have pointed out that innovation is essential to progress. At the same time, they've acknowledged that people can be wary of the change innovation involves. That notion goes as far back as the 1500s, when Italian political philosopher Niccolo Machiavelli touched on it in his best-known book, The Prince. “There is nothing more difficult to take in hand, more perilous to conduct, or more uncertain in its success, than to take the lead in the introduction of a new order of things,” Machiavelli wrote. Theodore Levitt, economist and marketing expert: “Creativity is thinking up new things. Innovation is doing new things." As much of the nation's transportation infrastructure nears the end of its design life and traffic congestion continues to grow, highway agencies look for new ways to reconstruct highways and bridges faster, better, and more safely and economically. One promising tool is the performance contracting for construction method used on the Michigan Highways for LIFE project. Decision tree: Is performance contracting the right choice for your project? Performance contracting is a results-oriented approach that allows transportation agencies to define desired project outcomes, or performance goals, while giving contractors the responsibility for determining how to achieve those goals. It fits with the Highways for LIFE focus on setting performance goals for projects that establish desired results while allowing for innovation and creativity. State and local highway agencies benefit from the opportunity to clearly describe the desired outcomes the contractor must deliver on the project. Contractors benefit from the flexibility to determine how to accomplish the agency's goals for the project in an innovative and competitive manner. They also benefit from sharing the rewards of a project well done through contract incentives. Everyone benefits from innovations introduced by the contractor that may lead to improved safety and mobility, reduced costs and faster project completion at equal or better quality. The Federal Highway Administration has developed a flexible framework to help agencies implement performance contracting for construction. Available at www.fhwa.dot.gov/hfl, the framework includes recommended processes, lessons learned and sample materials developed with input from public and private sector stakeholders. FHWA is conducting a pilot initiative to encourage states to implement performance contracting for construction. States that volunteer for the pilot receive technical assistance and participate in a tailored workshop on using the performance contracting framework. Members of the Michigan and Florida Departments of Transportation have attended workshops, and another is planned in Colorado. To learn more about becoming a pilot state or to schedule a workshop, contact Mary Huie at (202) 366-3039, or Chris Schneider at (202) 493-0551. A team of U.S. transportation experts observed performance contracting during a 2001 study of contract administration in the European highway industry, which has used the approach for many years. To view the team's report, Contract Administration: Technology and Practice in Europe (FHWA-PL-02-016), go to http://international.fhwa.dot.gov/contractadmin/contractadmin.pdf. Innovations are helping to slash the construction schedule from two years to one at the 24th Street Bridge replacement project in Council Bluffs, Iowa. Construction began on the $12.5 million project in late 2007 and was scheduled to be finished this November, according to Joe Jurasic, construction/transportation engineer for the Federal Highway Administration's Iowa Division.Faster completion will mean less disruption for the traveling public and less exposure of the public and workers to a work zone. A crane lifts a precast panel onto the bridge to span the steel girders on the Iowa Highways for LIFE project. In support of its innovations on the project, the Iowa Department of Transportation won a $1 million grant from the Highways for LIFE program, which is aimed at encouraging innovations that speed construction, improve quality and enhance safety on the nation's roadways and work zones. The new interchange of 24th Street with I-80/I-29 is an initial component of major improvements to the interstate system in the Council Bluffs area. The improvements will upgrade mobility through the I-80, I-29 and I-480 corridors. From Council Bluffs, I-80 crosses the Missouri River into Omaha, Neb. The old four-lane, four-span 24th Street Bridge is being replaced with a new six-lane, two-span bridge. Supported by high-performance steel girders that have higher resistance to corrosion and fatigue, the new bridge will feature a multiuse trail on the west side and a sidewalk on the east side. In awarding the contract, the Iowa DOT used A+B bidding, or cost-plus-time bidding. Such a contracting method rewards a contractor for reducing project construction time. 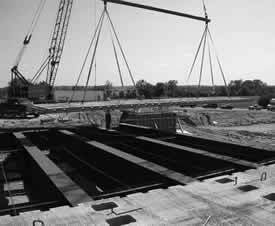 A major factor in shortening the project's duration was the use of precast concrete deck panels that span across the five-foot-deep (1.5-meter-deep) steel girders. High-performance concrete, another innovation, will be used for the bridge footings, the pier and abutments, the closure pour between the precast panels, the sidewalk concrete and the wearing surface. High-performance concrete is more durable than conventional concrete. A structural health monitoring system will be implemented to evaluate and document the innovative aspects of accelerated construction, Jurasic said. The monitoring plan includes health monitoring instrumentation to assess the integrity of the structure and deck panel system during and after construction. Self-consolidating concrete, which flows readily around reinforcing steel while maintaining its homogeneity, is being used for the precast panels, as well as in the pockets for the shear studs in the precast panels. And the Iowa DOT came up with another innovation: fully contained flooded backfill placed behind the abutment backwall. A geotextile is laid behind the abutment and the area is filled with granular backfill and flooded. The water drains out, and the granular backfill consolidates to prevent settlement of the approach slab. 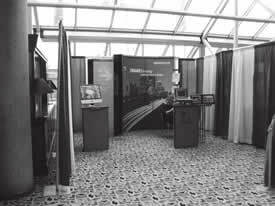 Highways for LIFE Exhibit Booth. For more information, contact Joe Jurasic at (515) 233-7304. Look for the Highways for LIFE booth—#111—at the American Association of State Highway and Transportation Officials Annual Meeting, Oct. 16-20, in Hartford, Conn. View our interactive exhibit and visit with the HfL team to learn how innovation is transforming the way U.S. highways are built. The deadline for submitting grant applications for the final round of Highways for LIFE demonstration construction projects has been extended to Dec. 30, 2008. “With the prediction that the transportation appropriation bill for fiscal year 2009 may not be approved until later this year or early next year, we've extended the solicitation period,” said Mary Huie, Highways for LIFE program coordinator. Under the program, the Federal Highway Administration funds projects that use innovative design or construction approaches that cut congestion while boosting safety, quality and user satisfaction. The project innovations must be readily available, but something that the highway agency has never or rarely used. Project applications must specify performance goals that define results in the Highways for LIFE focus areas of safety, construction congestion, quality and user satisfaction. Depending on the availability of FY 2009 funding for the program, selected projects may receive a program grant or a waiver to allow 100 percent Federal-aid funding for the project. States not selected as Highways for LIFE grant recipients in the past will receive first consideration for funding. If additional funds are available after the 2009 projects are selected from the solicitation, FHWA will continue to accept applications until all funds have been awarded.